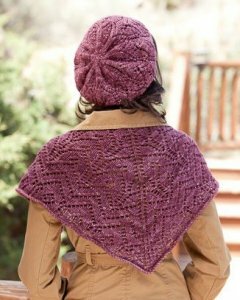 Taken from Interweave Knits Magazine - '12 Holiday Gifts: "The lace pattern of the beret mimics that found on the shawlette. The shawlette and beret both use a small amount of yarn and work up quickly." This pattern is in Interweave Knits Magazine - '12 Holiday Gifts, page 128. Size US 5-16" circs & US 8 DPNs for hat, US 9-24" circs for shawlette (or sizes required to obtain gauge) are required but not included. Finished Measurements: Beret is 20" brim circumference & 11" in diameter, Shawletter is 41" wide and 18" deep. Color Shown is Dried Rose.